How can economic development increase not only prosperity, but also security and stability in post-2014 Afghanistan and the region? Can Afghanistan reclaim its unique position as a transit route between resources in Central Asia, Southwest Asia and the booming Far East? And what are Pakistan’s challenges and opportunities in this scenario? These were the dominant themes of the EastWest Institute’s advocacy and outreach mission to Pakistan’s capital of Islamabad from March 18-20, 2015, conducted as part of the Afghanistan Reconnected initiative (also referred to as the Abu Dhabi Process). The mission was carried out by a delegation of parliamentarians, former ministers and private sector experts from Afghanistan, Pakistan, India, the United States and Turkey. 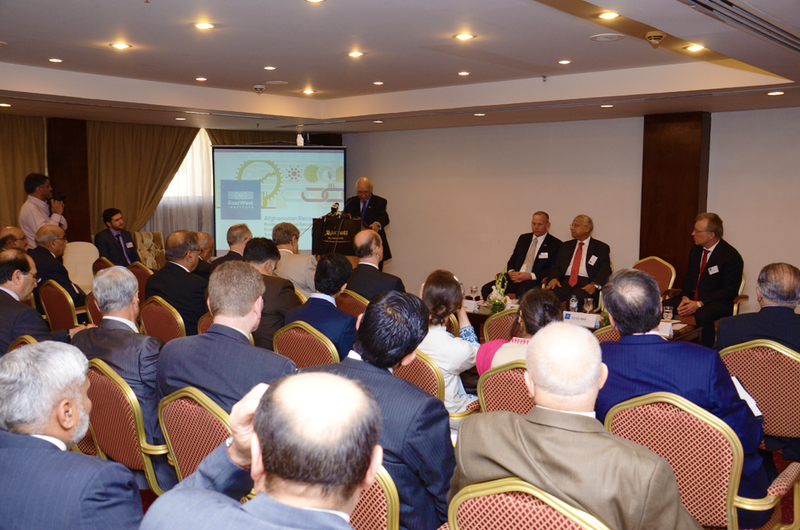 First convened by EWI in 2012, this distinguished group has continued to meet in order to address the region’s need for reforms and develop concrete recommendations for improving cross border cooperation in the fields of energy, trade and infrastructure. President of Pakistan H.E. 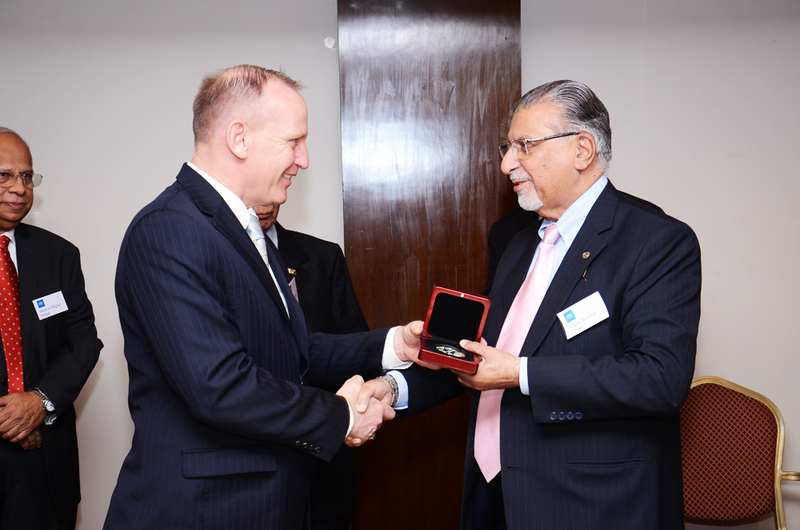 Mamnoon Hussain expressed sincere appreciation for EWI’s long standing commitment to the region. 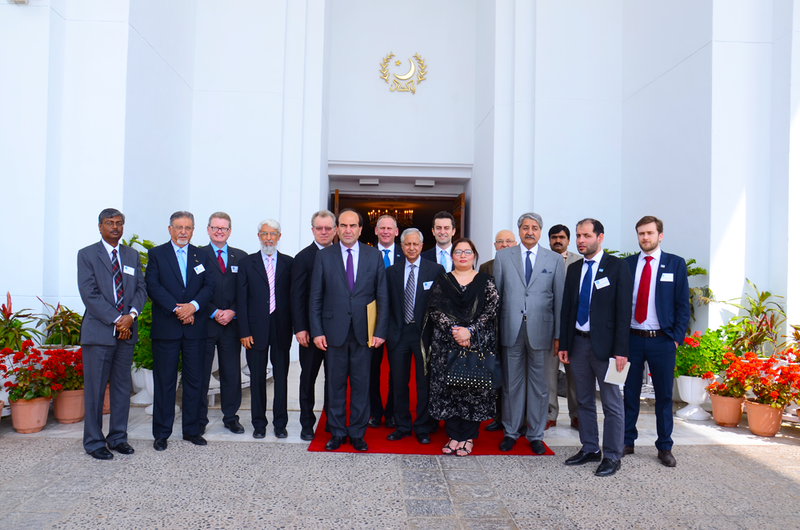 A series of intense exchanges with several high-level governmental policy-makers of Pakistan focused on the challenges of regional infrastructure construction and cross-border trade facilitation, including the development of a functioning regional network of roads, air and railway transportation as a prerequisite for further developments in trade, energy and mining. The relevant ministries of Pakistan also received the recommendations in writing and assured that these will be carefully considered. All meetings took place in a frank and friendly manner and were off the record, except the inauguration which drew great attention from the media. Speaking at that opening, Ambassador Martin Fleischer, EWI’s vice president and director of its Regional Security Initiative, underlined that the Afghanistan Reconnected Process is based on the conviction that security and economic development are interdependent. Fleischer also asserted that unlocking the economic potential of the region is dependent not only on Afghanistan’s own transformation and institution-building, but also on reforms in Afghanistan’s neighboring countries and cooperation between them. In his keynote speech, H.E. Sartaj Aziz, advisor to the prime minister on foreign affairs and national security, termed Afghanistan a vital connector for regional energy, communication and transmission corridor. Discussing his government’s efforts to link these corridors, Aziz referred to recent agreements on the Peshawar-Kabul Road and Chaman-Qandhar railway lines, affirming that these links would not only improve trade relations between the two countries, but would also help connect Central Asia with South Asia. The extension of the Afghanistan-Pakistan Transit Trade Agreement (APTTA) to Tajikistan and other regional countries would be a great step in the right direction. Aziz stressed his government’s fundamental conviction that only peace and development in Afghanistan can bring stability to the region. Pakistan would continue to support the reconstruction of Afghanistan, particularly in a post–NATO situation. This would include bilateral and regional projects, such as the Kunar dam, with its capacity to generate 1500 MW of hydro-electricity, and the Central Asia South Asia Electricity Transmission and Trade Project CASA-1000 and its upgrade to CASA- 1300 with addition of 300 MWs. H.E. Sayed Tariq Fatemi, special assistant to the Prime Minister of Pakistan on Foreign Affairs, lauded EWI’s initiative and stressed the imperative role of the business community and private sector in expanding Pakistan-Afghanistan economic cooperation and advancing the shared goals of regional connectivity and economic integration. “A peaceful neighborhood is a pre-requisite for Pakistan’s economic development” he stressed and added that since the establishment of a new national unity Government in Afghanistan, relations between Afghanistan and Pakistan had substantially improved. H.E. Shahid Khaqan Abbasi, federal minister for Petroleum and Natural Resources urged Pakistan, Afghanistan and neighboring countries to engage in intensive partnerships to meet their growing energy demands, and to harness the massive economic opportunities provided by energy trade. He said that the region is at the early stages of a transition toward an energy economy in response to a global trend toward prioritizing energy security. Abbasi stressed that there are no political obstacles to the implementation of major regional energy projects such as TAPI and CASA-1000. As a gateway to resource rich Central Asia, Afghanistan holds the keys to unlock a prosperous regional economy by acting as a transit route for energy supplies from Central Asia to energy markets in South Asia—a “scenario with win-win potentials for all stakeholders,” Abbasi said. H.E. Eng. Khurram Dastgir Khan, minister of Commerce, outlined Pakistan’s plans for massive investment to improve infrastructure on the border with Afghanistan and India, and initiatives to upgrade port capacities at Karachi, port Qasim and port Gawader, in order to provide opportunities for Afghanistan and other Central Asian Republics to expand access to regional and international markets. Khan affirmed that new land-ports will be constructed at the Torkhan and Wagah borders to expedite Afghan exports and imports across Pakistan. H.E. Mohammed Zubair, minister of Privatization, was briefed on the Turkish experience with private sector engagement in border management, which has led to substantial improvement in Turkey’s border posts at little or no cost to the government. 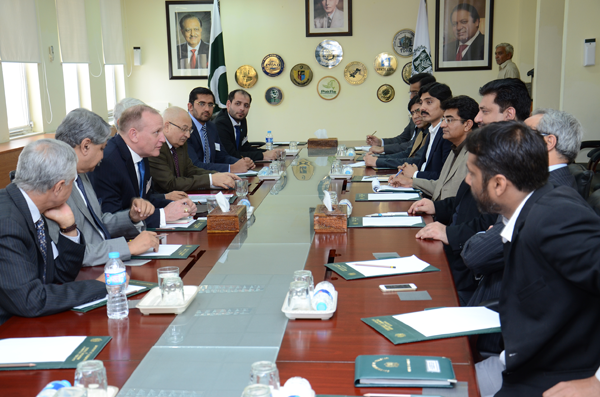 The minister expressed a desire to explore the applicability of this innovative model in Pakistan. A cross-cutting theme in all talks was the need to normalize relations with India, or at least put political issues aside, so as to foster cross-border economic cooperation. The next advocacy mission of EWI’s Afghanistan Reconnected series will take place in New Delhi mid-June this year. Afghanistan Reconnected is funded by the governments of Germany and the U.A.E., as well as private donors. The mission to Islamabad was supported by the Pathfinder Group and its Chairman Ikram Seghal, who is also a member of EWI’s board of directors, and the Karachi Council on Foreign Relations (KCFR). EWI’s Chief Operating Officer Mr. James Creighton signed a Memorandum of Understanding with KCFR to sustain the cooperation between the two institutes.